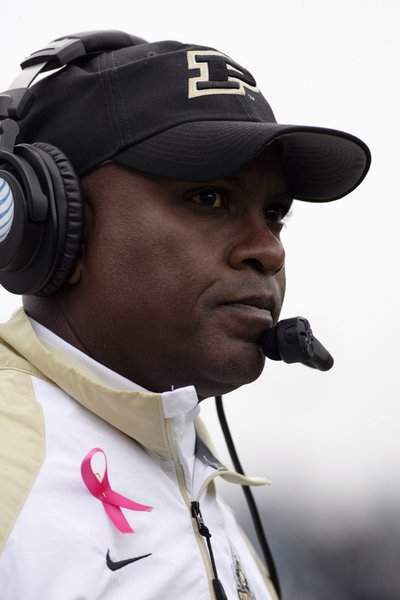 WEST LAFAYETTE – For those who follow or who have an interest in Purdue football, connect the dots from Darrell Hazell’s 31/2 seasons as head coach, and this was not going to end well. And so on Sunday morning – less than 24 hours after Iowa ran over, through and around the Boilermakers on homecoming in Ross-Ade Stadium – new athletic director Mike Bobinski made what he called a difficult decision to fire Hazell. 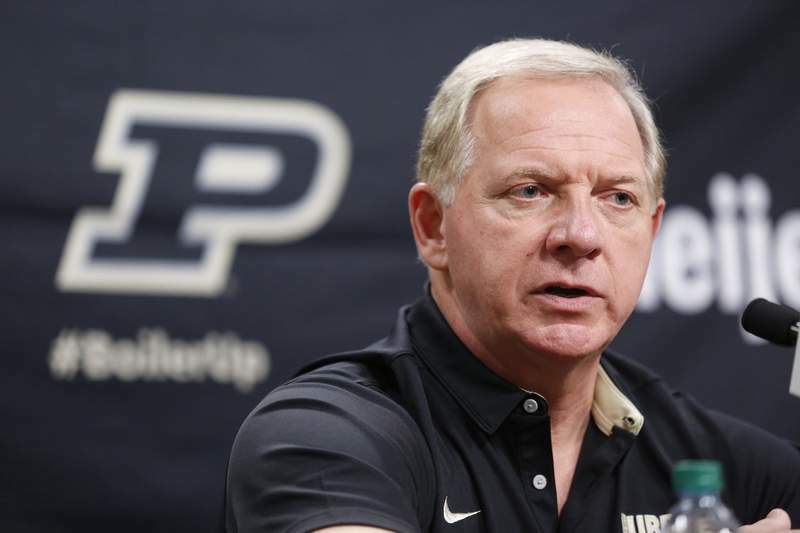 While Bobinski has been on the job for less than two months after coming to Purdue from Georgia Tech to replace retiring Morgan Burke, the data for a football coaching change was at the new AD’s fingertips. Hazell coached 42 games at Purdue, and won only nine. His Boilermakers were 4-0 against FCS teams – Indiana State (twice) and Eastern Kentucky and Southern Illinois once each – but only 5-33 against FBS teams. The Boilermakers were 3-24 against Big Ten opponents, including only one conference victory in Ross-Ade Stadium. Probably most puzzling is the fact Purdue never won consecutive games during the Hazell era, going 0-9 after a victory, and losing those nine games by an average of 21 points. "We have to fix that," interim head coach and receivers coach Gerard Parker said during a Sunday news conference. One of those nine defeats after a victory was Saturday when Iowa led 35-7 at halftime, sending many fans to their tailgate parties. The final score was 49-35, but it really wasn’t that close. Purdue still has six games to play during the 2016 season, beginning Saturday at unbeaten Nebraska, but the final pages of the Book of Hazell have been closed now, and it’s time to move on. So how do Bobinski, Purdue President Mitch Daniels, the board of trustees and a disgruntled fan base fix this mess? To begin with, the Boilermakers need better players. Lots of better players. In losses to Cincinnati, Maryland and Iowa, it’s evident Purdue has not recruited well during the Hazell era. The 2016 recruiting class included only two players from Indiana, and one of those – freshman receiver Jackson Anthrop from Lafayette Central Catholic – is the son of two Purdue grads and the younger brother of former Boilermakers basketball player Dru Anthrop and former Purdue receiver Danny Anthrop. "This is a highly competitive business, and we know we have to get better players and faster players," Parker said. Purdue is investing $65 million in its new football performance center and in permanent lights for Ross-Ade Stadium, an element Burke did not think was necessary. Even though as recently as 2000, Purdue had quarterback Drew Brees and played in the Rose Bowl, the program has been slowly heading in the wrong direction, always being last to the dinner table in Big Ten facilities upgrades, assistant coaches salaries and marketing strategies to endear itself to a fan base that now is apathetic, waiting for the basketballs to begin bouncing in Mackey Arena. The new coach must quickly make friends with the Indiana high school football coaching community and sell an exciting brand of play, such as Joe Tiller’s "basketball on grass," that had Brees, Kyle Orton and Curtis Painter throwing passes as soon as they got off the bus. So, where will Bobinski look? While some Purdue fans would love to see former LSU coach Les Miles replace Hazell, it won’t happen. This is a monumental rebuilding project, and Miles will want to step into a higher profile Power 5 conference job. Smart money will be on either Western Michigan’s P.J. Fleck or Illinois State’s Brock Spack, a former Boilermakers standout linebacker and Tiller’s long-time defensive coordinator who, like basketball coach Matt Painter, understands the Purdue culture. Fleck’s energy is exactly what Purdue needs, although he may be positioning himself for a higher profile job this season with an undefeated Broncos team that is fun to watch. Spack really should have gotten the job when Burke hired Danny Hope to replace Tiller as head coach after the 2008 season. Hope was 22-27 in four seasons and was fired at the end of 2012. 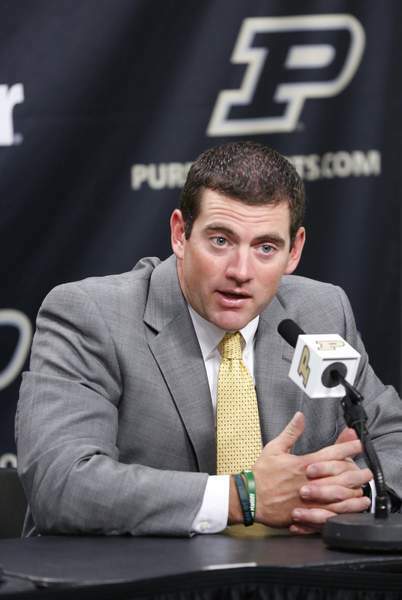 In Spack, Purdue would get a coach who knows the Indiana high school scene and who is familiar with all that is Big Ten.